Edwin Reinold has had a life long passion for sound, the way instruments make their sounds and how you can manipulate an instrument into giving it a different character. 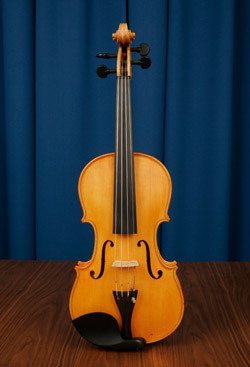 He wanted to make a documentary about this subject which was the reason why he started to build an instrument himself. He worked for several years in the Dutch film industry as a filmmaker , special effects man and building/creating sets.. In the end, he didn't make the documentary, but he became a luthier himself. 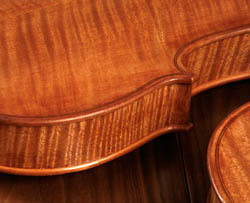 After completing his first instrument he wanted to use the best lacquer there was to put onto the instrument. Soon he became fascinated with the instruments of Stradivarius.. After a long process he discovered the Stradivari finish, knowing for sure what the ingredients are and how to apply them to the instruments. When he applied it to the first instrument he build, a double backed flamenco guitar, he made for guitarist/composer Jacco Muller, he immediately noticed that the sound quality of the guitar had raised spectacularly. Mr. Muller, noticed this as well, but also had some reservations about the guitar until after playing it for a couple of weeks, making the instrument come alive in a grand way. He had found his soulmate. His mineral primer gives the same results on other string instruments such as the violin and the cello. He tested his mineral ground layer on hand built Chinese violins. 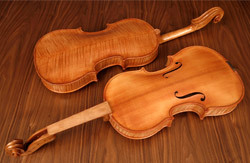 By professional violin players and world renown restorers, the sound of the violins Reinold coated is valued way above what would be expected for these instruments and even called impossible, considering their original quality. Jacco Muller: Reinold told me the guitar had to be broken-in because the minerals ‘had to be started up’. In the beginning I didn’t think the sound was fantastic. But, it is normal that you have to break in a guitar; the development of the sound always happens very gradually. But after 6 weeks of playing, the guitar suddenly sounded fabulous! It was like it had aged 20 years! I never encountered something like this before. It had become the perfect instrument! And the most curious thing is that when I don't play it for two day's the instrument is falls asleep, like there is a soul in it thinking: you don't want to work, than I don't want to work either. 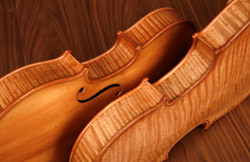 This happens to be one of the unique qualities attributed to Stradivarius violins. They have to be played regularly to preserve their unique sound. Lying in a bank vault they would ‘die’. “I have a great Hermanos Conde flamenco guitar”, says Jacco Muller, “but, since I own the Reinold guitar it remains in it’s case”.